All soils initially come from rocks, this is termed the ‘parent material’. The Parent Material may be directly below the soil, or great distances away if wind, water or glaciers have transported the soil. In addition to the soil parent material, soil formation is also dependent upon other prevailing processes affecting soil formation. The soil formation process is termed 'pedogenesis'. Climatic conditions are important factors affecting both the form and rate of physical and chemical weathering of the parent material. The formation of soils can be seen as a combination of the products of weathering, of structural development of the soil, of differentiation of that structure into horizons or layers, and lastly of its movement or translocation. In fact there are many ways in which soil may be transported away from the location where it was first formed. In the UK, one of the most important of these factors is the effect that the ice ages have had. As glaciers pushed southwards down the country, they acted like giant bulldozers pushing soil ahead of them. Glacial ‘till’ or ‘drift’ deposits resulted many tens or even hundreds of miles from where the soils were first formed. When the weather warmed up and the glaciers melted, great mounds of soil were left behind, these are called ‘moraines’ and can be very impressive to see - clearly demonstrating the power of glaciers. Water is also very important in moving soils. As rivers flow, so they transport soil particles along. If soil is washed into a river, the smallest particles will be carried the furthest by the water as they weigh the least. Heavier particles, such as sand, will be dropped earlier by the river. If you see an aerial photograph of a river as it flows into the sea or a lake, you may see the ‘fan’ of deposited soil materials. Soils deposited in this way around lakes and rivers are termed ‘alluvial’. Soils deposited in lakes are called 'lacustrine', soils deposited by rivers 'riverine' and by sea 'marine' alluvial soils. Rainfall is also important in washing soil off exposed land. Even gentle rain can dislodge and move small soil particles. If this happens all across a field the process is termed ‘sheet erosion’.Where there is a lot of rain, small gulleys can form which can speed up the process of ‘gulley erosion’. In tropical countries where there is extremely heavy rain, these gulleys can become so deep that you can walk down into them. Farmers should be aware of the effects of erosion upon their soil resource. Fields on slopes should be ploughed in lines across the gradient to prevent excess runoff and erosion. However, one can often see fields ploughed down the slope. This has the effect of creating small channels for rain water, and these channels can soon enlarge. One way scientists can try to quantify the effects of such erosion is to employ dye tracers in the field. 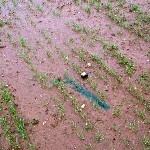 To do this, during a rain event, a dye tablet is placed in the field and the extent of the resulting runoff pattern then becomes only too clear. The wind is also able to move surprisingly large quantities of soil. On occasions fine soil deposits can be seen in many parts of the South of England which have been blown all the way from North African deserts. Soil in your garden is likely to be well mixed both as a result of years of digging and from the activities of animals in the soil such as worms. In agricultural fields there may be less mixing as there are fewer animals present due to the use of chemicals and compaction from heavy machinery. Ploughs are used to aerate and mix the soil instead. Where ploughs are continually used at a certain set depth, there may form a hard layer called a ‘pan’ below which there is little mixing. Such hard pans can also affect the drainage in the field where water cannot flow downwards affecting crop yields.